10-MINUTE READ · By Supermetrics on May 8 2017. First things first. Let’s start with results. 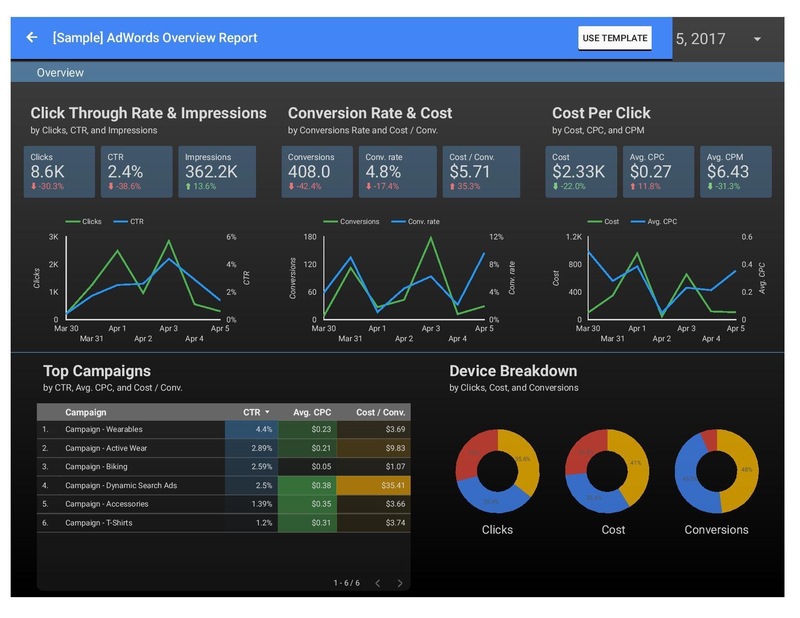 Here is the Adwords Overview template Google Data Studio offers. And these are the reports I copied for Facebook, Bing and Twitter. It took me 3 minutes each, 9 minutes in total. I’ll walk you through how to do it step by step. Bing is the most straightforward platform since its metrics and dimensions are almost identical with Adwords. Select dates -> Whatever date range you want to report on. I used 13 months in this template. Scheduled automatic refreshing for this sheet. Create calculated fields, CTR, Avg. CPC, Conv. rate, Cost / Conv. and Avg. CPM. 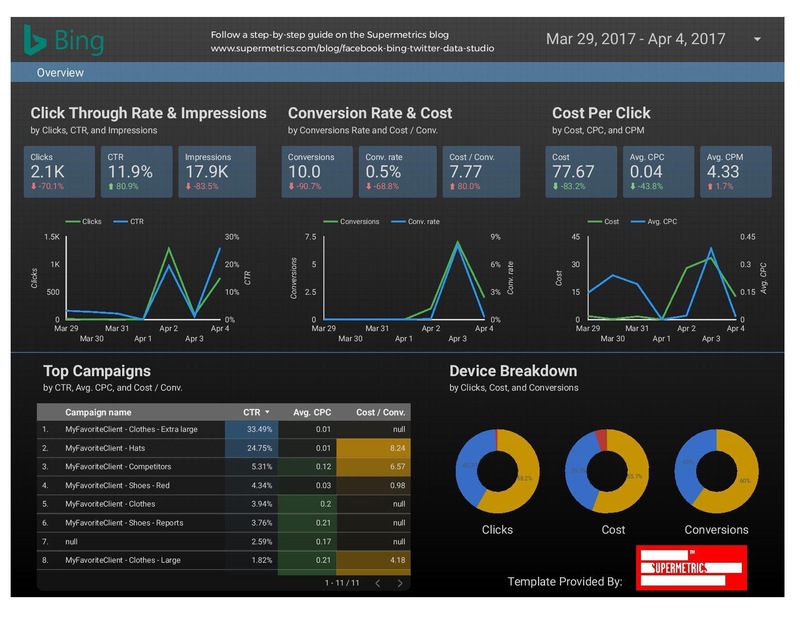 Your Bing Ads report is ready! The only thing to note is to choose Impression device as Device type in Bing and Offsite conversions as Conversions in Bing. Otherwise, the steps are the same. Select dates -> Whatever date range you want to report on. I used 2016-01-01 to today in this template. 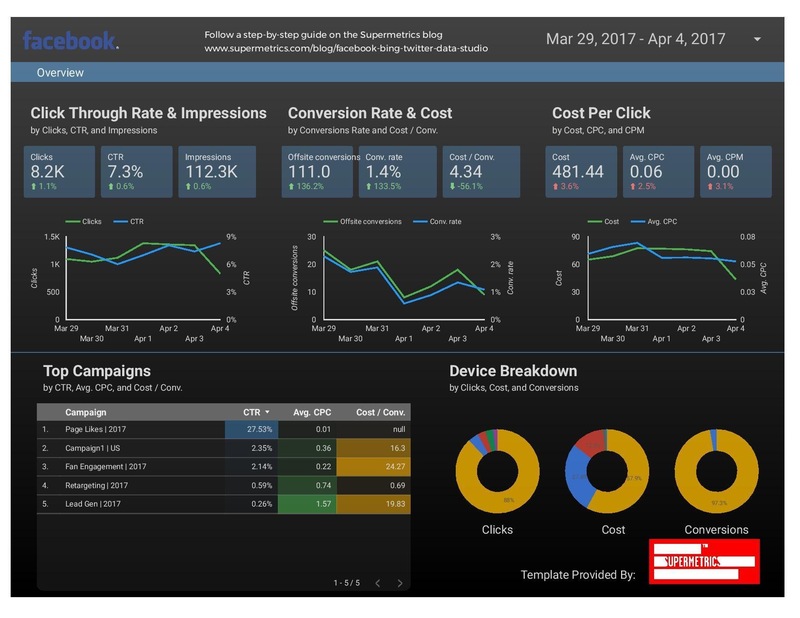 Your Facebook Ads report is ready! You can make an almost identical report for Twitter Ads apart from the device breakdown. Twitter offers a dimension called Platform which closely resembles to device. It includes iOS devices, Android devices, Blackberry phones and tablets, Desktop and laptop computers, Mobile web on other devices. Otherwise, the steps are the same as steps to create a template for Facebook. 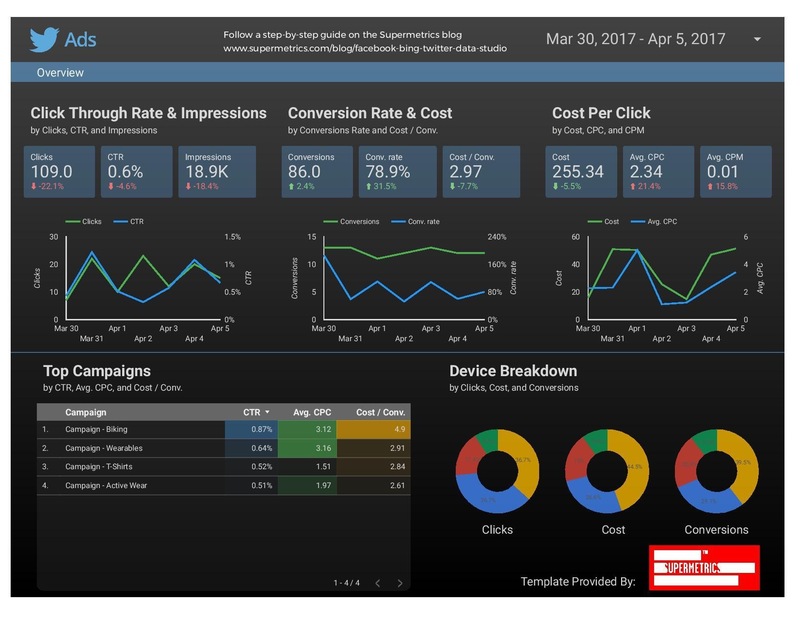 Before Data Studio offers native connectors for non-Google data sources, pulling data via the Sheets connector is the only option of making Data Studio truly a one-stop shop for reporting. I admit that it would require a bit more work than using native connectors. But it’s rather straightforward to learn and an invaluable skill for fully harnessing Data Studio. After all, the long tail of digital marketing platforms and tools means Data Studio will never cover all of them. Once you get the hang of using the Sheets connector, you can create reports for any data source in minutes. If you are using or plan to use Data Studio, what’s in your wish list of templates? Or do you already have any nice reports that we can help promote to our audiences? Feel free to tweet us.